GUI Automation Difficulties. When marketing collides with real life. Usually, it is good practice to automate any kind of routine. In testing, automation is vital. It helps decrease costs, makes testing tasks faster, and improves efficiency of your staff. It is a “no-brainer” to think about automating different testing tasks, especially when reading marketing materials or listening to a sales presentation of a “leading- edge-premier” robot software. Those reports are usually based on success stories from the world of the most complicated user interfaces – CAD software, graphics software or maybe some examples of extremely complex but good web design. Moreover, usually, these reports are true. 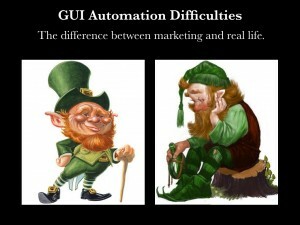 But you should think carefully before starting a GUI test automation project. In many areas of software development, GUI automation is not so easy and obvious, and your entire automation project can quickly turn into disaster, in spite of the visual attractiveness of the tools.